We have been doing some driftwood crafting here. I thought you might like to see what we have been up to. I blogged about it here if you want to see a bit more. Such a fun and busy time of year at our house. Hope you are all well and taking time to enjoy the season! We have been making all kinds of simple gifts around here lately. This is one that is very simple and sweet. Gather up some favorite nature finds to put in a cute jar with a little ribbon or yarn attaching a heartfelt note and you are all done. My mom loves white and we thought this jar of white shells we collected over the summer would be a wonderful gift for her. My son gave away a jar of sea glass he collected. I have always loved feathers in glass jars. You could also use acorns (just make sure they don't have larva in them) or even "pretty rocks" as my son likes to call them. There are so many possibilities. In the fall Lucia wrote a great post about migration here on TMG. In it she mentioned how she wished "there was some way to bottle up our recent stork sightings and give those to friends and family as holiday gifts". When I read that it brought to mind a gift idea I had been thinking about for some time. While I have not figured out how to bottle up a stork sighting I think a shadow box would be a great way to share nature with those we love. While we set about gathering nature finds for our nature exchange we also set a few things aside for some shadow boxes. These are going to a few of our favorite folks that love nature but might not be up for a nature exchange. After everything was gathered together we laid it out on the background. Once we were happy with how it looked we glued it down. We used a hot glue gun for this. Other types of glue would work but it might take longer to dry. Just make sure it is strong enough to hold the weight of the object once it is hanging on the wall. We purchased a shadow box from a craft shop but you could also make your own if you are the very adventurous crafty type. If you search the web for "build a wooden shadow box" you will find "how to" sites to meet just about every skill level. Here it is complete. It is amazingly hard for me to take pictures of things under glass but I wanted you to see the frame. It looks great on the wall. I am ready to make one for us to have here at home. ~ Adding pictures from a trip or you kids out in nature to the background. ~ Using post cards of local wildlife as a background. ~ Dividing the background into four sections to represent things collected in each season. ~ Think about the home of the recipient. Try to get a shadow box frame that will match their home decor. Our local craft shop had a wide selection. While we can't always share our nature experiences first hand with loved ones, we can offer a bit of nature's goodness under glass. Around this time of year, we start to think about the birds that don't migrate (or maybe they came from colder regions for the winter). We wonder how they survive, although we know they can fend for themselves. Still, what bird doesn't like a treat or two? Once it gets cold enough, we enjoy making "bird cakes" for our feathered friends, stringing them on ribbon or twine, and hanging them from a branch. Melt the nut butter gently over low heat, then place in a large bowl and stir in the dry ingredients. Allow to cool, then slowly add warm water and knead by hand until it forms a very thick "dough." Pat into small shapes or pans. Use the handle of a wooden spoon or a chop stick to make a hole for hanging. Freeze for several hours or overnight. Hang outdoors with string or ribbon. (You can also use cookie cutters if you chill the dough slightly; we pressed the dough into cutters, froze them, then released the cakes by rubbing the cutters with warm water). Nut and seed butters should be offered mixed with other ingredients such as birdseed or oats to prevent the butter from sticking in the birds' mouths. You can use suet or lard along with, or in place of, nut butter. Melt over low heat before adding other ingredients. While it may seem odd to feed birds animal fat, they glean fat from grubs and worms in the wild. However, avoid bacon drippings, which can have impurities. Many bird cake recipes call for cornmeal, cracked corn, or raw peanuts. All of these can have traces of aflatoxins (from fungus) that are extremely harmful to birds even in small quantities. If you choose these, make sure they're for human consumption--but it's safer to use cereal oats and birdseed. Many birds love sunflower seeds. Black-oil sunflower seeds are preferable to striped sunflower seeds; the latter have tough shells most birds can't crack. Or, use sunflower hearts. Before buying commercial bird feed (like we did), consider that it's often full of millet (tiny round seeds) mainly eaten by ground feeding birds that won't perch on a hanging feeder. Another seed-mix 'filler' to avoid is red milo, with reddish seeds slightly larger than millet. Few birds care for red milo, and so this seed is often spilled and wasted at bird feeders. Serve bird cakes when temps are chilly. At higher temps oils soften and coat chest feathers, a hazard for nesting birds whose eggs then clog with residue. Bird cakes also spoil in warm temperatures. To watch birds feeding on your cakes from a picture window, hang the cake closer to the window, 3 ft or less. Picture windows are grave hazards for birds that take off from feeders at full speed, injuring themselves (or worse) when they hit a window. 30 ft is a safe distance if you'd rather have the feeder further away. If using a feeder or perch, clean it with hot water and soap to prevent the spread of disease. Urban families should sweep under feeders and consider taking cakes in overnight to avoid providing food for rats. This site has lots of reliable information about feeding birds; and this page has a lot of information about helping birds avoid window collisions (read first before sharing with wee ones). Last, as a family, we participate (for a fee) in Project Feeder Watch, of which the Great Backyard Bird Hunt is a free part. PFW lasts from November through the first week of April; if you live in North America, it's a great activity to do with your kids. Here's a link to their free feederwatch kids' resources. Most of us have friends and family that spread around the country, maybe even the globe. We have such an amazing time learning about what is right out our backdoor and delight in sharing it with others. It is also great fun to get a package full of nature's goodness from far away. This would be a great time to contact a relative or friend to arrange a nature exchange for the kids as gifts for the holiday this year. We always have a nature table full of good things to share. We set about gathering up the best examples of our favorite nature finds. As we add new things to the collection we make a list. Mussel shell with seaweed hold. And sometimes add things that are not exactly nature made but we find often on our walks. The sea glass above and this bait bag from a lobster pot are great examples. It says somethings about our local area and might just inspire some research by our recipients. The smaller fragile things get wrapped up in tissue paper and placed into an egg carton. The larger items get wrapped up too and it all goes into the box. Sometimes we also include pictures of the kids out in nature, some postcards of local wildlife (our Museum of Natural History has a great collection) or some supplies for a nature based craft. Another fun and easy gift from nature. Have you ever done a nature exchange? We would love to hear about it. Gifts from Nature: Felted Rocks. Not too long ago, our family discovered a wonderful local beach. Rather than sand, it is covered with beautiful, smooth stones. Of course, a number of these rocks have found their way back to our house, and in fact, these days our seasonal nature table seems to have become a collection of beach rocks, acorns and not a whole lot else. Anyway, I thought that felting some of the rocks would be fun, and indeed, it turned out to be an easy and satisfying project. The result is a pile of lovely, fuzzy little rocks that look great on display and would make a fun gift, perhaps paired with pictures of your family collecting the rocks or a children's story about the trip to gather them. To start, mix a few tablespoons of dish soap into the bowl of hot water. The water should be about as hot as you can stand it and really, really soapy. For children, you can make the water less hot, but expect that you might have to occasionally dip their rock into your really hot water to get it felting again. This worked fine for us, and Mariam's rock turned out nicely. Also set out a bowl of cold water without soap. This is helpful for when your rock gets really soapy but you want to assess how far along you are in the felting process. Choose some roving and a rock. Spread the roving out and lay the rock down on top. Wrap the roving around the rock. Take another piece of roving and lay it down so that the fiber runs the opposite direction of the first piece. Put the rock on top and wrap the roving around it. Now you have a nice little bundle of wool and stone and you can begin the felting process. Dip the rock into your hot, soapy water and begin using your hands to rub the roving together around the rock. Be gentle at first, dipping the rock and rubbing it between your palms to flatten the roving and begin felting it. As the roving begins to change texture and become more like felt, you can start to handle it more firmly. Press the rock in between your palms and use considerable pressure to really rub the roving around and flatten it against the rock. Focus on working out any bumps or loose spots and work the roving around to cover any bits of rock poking out. Keep dipping the rock into the hot water and then rubbing it between your hands. Dip in the cold water occasionally to rinse some of the bubbles and see how far along you are in the felting process. Your rock is done when the entire thing feels as though it is covered in a tight little pocket of felt. There shouldn't be any loose spots. Squeeze out the soap a bit and dry the rock somewhat by wrapping it in a towel and applying some pressure to soak up excess water and soap. Set aside to dry completely. I love wreaths made out of found objects of the season and when I saw these gorgeous examples from mayamade, I knew we needed to share them with you all. 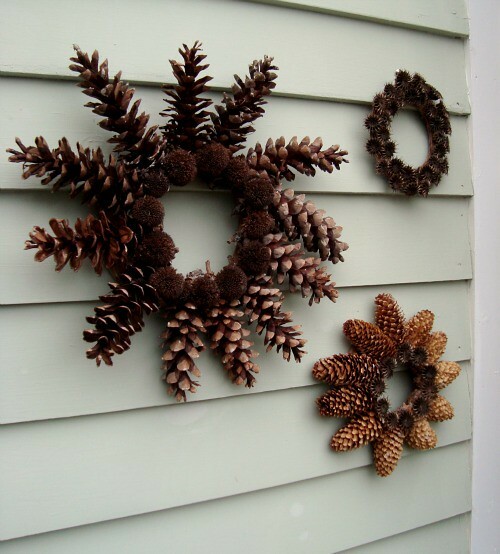 Seed pods, grasses, and feathers could all be used to customize your wreath to your area of the world. And what a better use for tidying up a cluttered nature table! Here on the Virginia Coast, I think ours would have to include a few shells. Pop on over to her site to read full instructions. And for a full list of our ever-growing list of Gifts from Nature, please visit our Gifts from Nature page. And if you and your family are making holiday gifts from nature items we would love to post it to our page. Just email me! Today we have a Gifts from Nature submission from our good friend and TMG reader Cindy of Zach Aboard. While waiting for their most adorable new baby girl to arrive, Cindy and her son Zach made beeswax candles using sand collected from the shore. 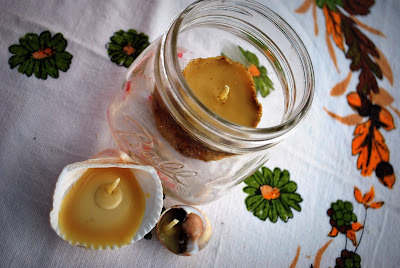 And I love the ideas of little seashell candles as candle vessels too. I think these could be adapted to use as advent or hanukkah candles, maybe in a bowl of sand or other collected nature items. How pretty that would be! Please follow the link to Cindy's blog for specific directions. Thanks Cindy and Zach for the great submission! Please visit our TMG Gifts From Nature page for a full list of gift ideas inspired by nature.